Glenpictures has a medium size studio available for hire. 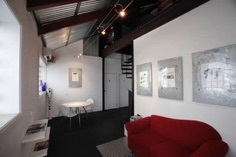 The studio is ideal for photography or video productions. It has an 8 metre wide full wrap around white cyclorama with a height of 3 metres. One of our speciality areas is on-line streaming. We have an extremely portable and inexpensive system which can allow sponsors ads to be broadcast during the multiple camera capable live stream. Graphics can be added on screen and even instant replays especially applicable to sport orientated event. glenpictures is an experienced producer of feature films. ‘A Second Chance’ has been sold and exhibited world wide. Check out the feature film link above for all the details and trailer. glenpictures.tv is a video, film and photography production company with studio and offices at Edmund Street in Norwood, South Australia. The facility incorporates a studio, post-production vision & sound suite, and offices. It is the base of talented director/producer & master photographer Clay Glen.